For an athlete there's no greater honour than representing one's country at the Olympics. Jo Caruana spoke to the six local soon-to-be Olympians about to do just that. The Maltese Olympic delegation began their journey to China amid much excitement and jubilation. And why not? Here were six people, all at the top of their game, off to make their mark on the world's biggest international sporting event. And boy were they ready. "Malta debuted in the Olympic Games in Amsterdam in 1928, and here we are ready to compete again," said Chef de Mission Julian Pace Bonello, who is forming part of Team Malta for the second time. "This year we are taking six extremely capable athletes to compete in four sports - athletics, judo, swimming and shooting. They were chosen in different ways - Ryan Gambin qualified in the 100m butterfly, William Chetcuti and Marcon Bezzina received an invitation from the international federation and Charlene Attard, Nicolai Portelli and Madeline Scerri are joining us through the Olympics' measure to ensure that all countries are given a fair chance to compete in swimming and athletics. "These athletes have been training unbelievably hard in recent weeks and months to meet the high standards and they are rearing to go, but at the same time we have our feet firmly on the ground. It will be amazing to watch them compete and I'm sure they will continue to be the pride of our nation." Charlene Attard holds the national records in the 200m as well as the 60m outdoors. She has represented Malta at the Games of the Small States of Europe and walked away with four medals in the last edition: silver medal in the 100m, bronze medal in the 200m, silver medal in the 4x100m and bronze in the 4x400m. Charlene will be competing in the 100m sprints at the National Stadium on Saturday. "It's every athlete's dream to be an Olympian; it's been my wish for as long as I can remember. All the best athletes in the world take part so it's guaranteed to be a fantastic show. I'm especially looking forward to the opening ceremony as I think it will be amazing to watch and be part of, plus I can't wait to race of course. "My aim is to reach my personal best, to go faster than I've ever managed to before. My training was set out in a certain way to allow me to peak during the race; it's been completely gruelling but hopefully it will have been worthwhile! 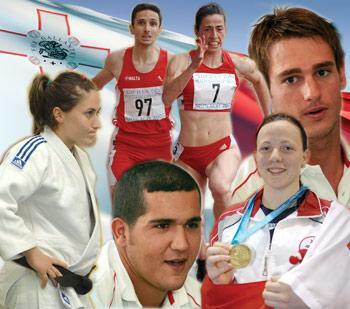 "Unfortunately Malta is lacking a sports culture. Kids get involved at a young age but sport gets pushed aside when their studies become stressful - physical education should be a compulsory subject for all students. I think it's vital that something be done to motivate them. For the most part (in 99 per cent of cases) sport is a hobby, but people should see beyond this and embrace a healthy lifestyle. Representing your country is just one of the benefits to taking sports seriously." Nicolai Portelli is Malta's leading 400m athlete and has been unbeaten locally for the past five years over the same distance. He holds the national record which is set at 48.14 seconds. Recently, he also claimed the national title in the 200m. Nicolai will be competing in the 200m sprints at the National Stadium on August 18. "The Olympics are an event that I have always wanted to go to; it's the ultimate achievement of my athletic career, so I am really looking forward to take part. Apart from focusing on the competition itself, which at the end of the day is the reason for me going to the games, I am also looking forward to living my dream and experiencing the excitement of the Games. There is so much history to them, together with the so many values which make the Olympics one of the biggest and most unique events on earth. I am looking forward to competing at such a high level. "While I'm here, my main goal is to run well and give my best shot at registering a good time in the 200m. Aside from that, I am looking forward to the Games in general, that is from the social aspect as well as from a sports perspective. I'm also really excited about actually seeing the venues and all that China is offering during the Olympics. "My training has been going strong and I've also been competing as much as possible. My coach, Vladimir Douchenkov, prepares my yearly training plan outlining what we will be focusing throughout the year. My last international meeting was in Tunisia, where the level of competition was high. It gave me the experience of running against some tough competition and helped improve my capabilities. Just before the competition at the Olympic Games we will taper to try and peak once again. "Sports in Malta is starting to be given the importance it deserves, however, we still lag behind compared to other countries. We still need to develop the sporting culture further. There are so many opportunities which one can gain from sport - take the Olympic Games as an example!" Madeleine Scerri is a 19-year-old Maltese swimmer residing in Australia; she represented Malta for the first time at the Games of the Small States of Europe in Monaco in 2007, winning three bronze medals in the 200m and 100m backstroke and in the 4x100m with the medley team. She will be competing in the 100m freestyle at the National Aquatics Centre and will be in action on Wednesday. "I'm so excited! I'm proud of myself for having secured the opportunity to represent Malta. Of course racing will be my focus while I'm there and it promised to be the most amazing experience. But I'm also thrilled to be staying in the Athletes' Village with all the other competitors from different sports. "It will be amazing to watch a lot of my idols compete and to see first-hand the highest quality of sport that is on offer. There is so much to learn about competing at the highest level. There are going to be some amazing competitions and races, and just being there will be so fantastic. "My preparation has been ongoing. I've had to keep up with the training workload while also trying to stay relaxed. "I think the sports scene in Malta has improved quite a lot and there are many young athletes that are showing a lot of potential, particularly at swimming. It's hard because there isn't always a large volume of Maltese athletes to compete against so I think it's important that they keep doing what has been done recently and attend training camps and international competitions to have a good amount of competition. I think at there should be a greater emphasis on sport at schools, not only so that people can learn different disciplines from a young age and keep improving, but because sport helps in many areas of life, such as goal setting and time management." Ryan Gambin recently moved to Malta from Australia to follow his dream to represent and compete for Malta in swimming. He represented Malta for the first time this year at the European Swimming Championship. Ryan will be competing in the 100m butterfly at the National Aquatics Centre on Thursday. "Swimming at the Olympics is a lifetime achievement for me. I was literally thrown into the water at an early age to keep me occupied and out of trouble. I had a tendency to misbehave and my mother found that swimming was a good way to tire me out! "I follow a very 'race specific' programme which I developed for myself. I chop and change some things but I keep the same principles. I only do things in training that relate directly back to the race at hand. A coach once sat me down before a season and said, 'What do you want to do?' to which I replied, 'Swim the 100 butterfly faster than anyone else.' So he said... 'OK, let's do the things that make that happen then.' Anything else is a waste of time and energy. "Whenever the going gets difficult, I remind myself of why I'm doing it. I think of my goals and I relate it back to how it is going to feel in a race. That usually pulls me through the tough sets. I would love to see if I can sneak into a semi-final at the Games. Once in a semi, who knows what could happen!" Marcon Bezzina made her debut at the Olympic Games in Athens in 2004. She had a tough opponent and was soon eliminated but has since had four years to prepare and develop her competition experience. During this period she has claimed the gold medal twice in two different weight categories at the last two editions of the Games of Small States of Europe in Andorra 2005 and Monaco 2007. Marcon will be in action on Tueday at the Beijing Science & Technology University. "As with any sport, one's skills, technique and fighting strategy doesn't develop overnight. Obviously, it requires a lot of time, dedication, sweat and tears to make it to the top at national level, let alone at the international level. "My preparation for the Games started early this year and it's been hectic. My ongoing development programme for it has involved participation at a number of international tournaments and training camps. "Earlier this year I met up with all the Olympic hopefuls at the trial games in Athens; it gave me the necessary experience to evaluate my opponents in real life. It was daunting but necessary! These games are tough and we are ever hopeful of getting a medal for Malta one day - it's not impossible!" William Chetcuti is no newcomer, having represented Malta at the Athens Olympic Games in double trap where he managed to make it to the barrage final and placed ninth. Four years later, he is once again representing Malta. William will be in action on Tuesday at the Beijing Shooting Range. "I started shooting around a decade ago, aged 10. My father, a shooter himself, introduced me to the sport and was my coach for a number of years. "I know the Olympics will be hard and that everybody will be expecting me to win a medal or finish in the top 10, I'm prepared for that. I'm ready to strive towards that but I'm also very grounded - these aren't my first Olympics and I know the competition is stiff. I have competed with these guys many times at similar high-level competitions, so I know I stand a good chance. The key ingredients to success are a lot of practice, a natural ability and good hand-eye coordination. Shooting is all about being quick and alert. My dream is to win an Olympic medal and I will do anything I can to make that dream come true!"